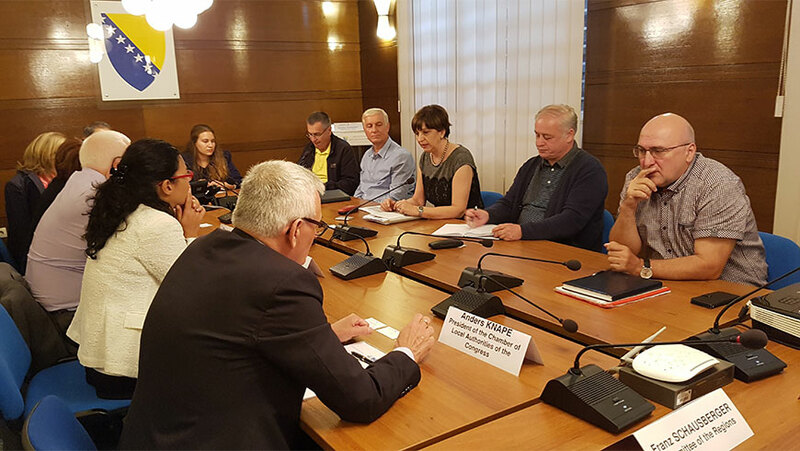 On 25th of June 2018, a delegation from the Congress’ ‟Reflection Group on Mostar” met in Sarajevo with the President of the Central Election Commission (CEC) of Bosnia and Herzegovina (BiH), Irena Hadziabdic, to discuss the situation of the country several months prior to the general elections on 7th of October 2018. The delegation was joined by Franz Schausberger, Member of the EU-Committee of the Regions and Chair manof the CoR’s Working Group on Western Balkans. In the meeting, the complexity of the situation in this city Mostar was underlined as well as that the Central Election Commission was technically prepared to hold local elections in Mostar as soon as a solution will be found. Moreover, the Congress delegation and the Commission also exchanged on the forthcoming general elections to be held in BiH on 7th of October 2018 and particularly on the regional elections which will be observed by the Congress. Some important technical improvements have been achieved, despite the fact that there was no breakthrough in respect of the required crucial amendments of the Electoral Law. The Congress Reflection Group was set up to contribute to a sustainable solution for restoring local democracy in Mostar where since ten years no local elections have been held due to political stalemate. The visit of the Reflection Group in Sarajevo and Mostar is part of the Congress activities to promote local and regional democracy in Bosnia and Herzegovina. In addition to the observation of the regional elections, the Congress will also carry out a monitoring visit in November 2018, to evaluate the implementation of the European Charter of Local Self-Government.